Stunning sea views from the living room/outdoor patio and both bedrooms. 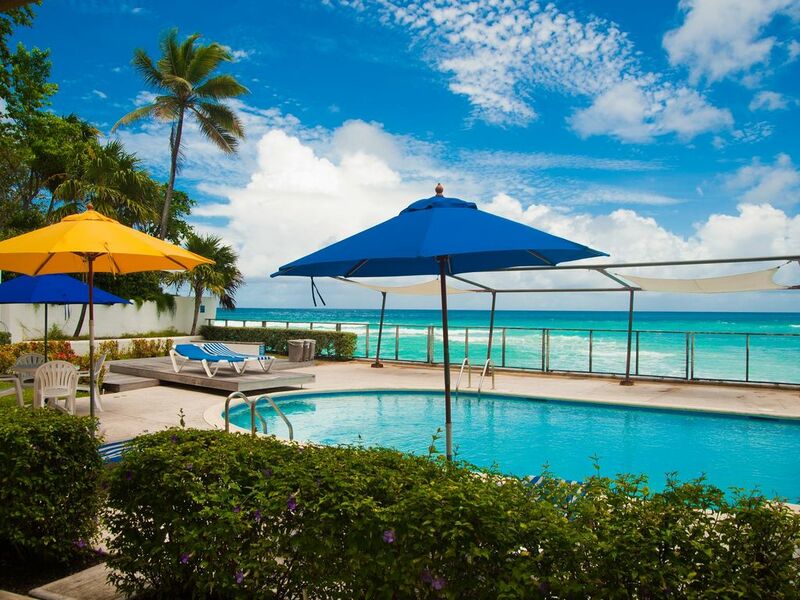 Located on the sea and small beach in the heart of the famous St. Lawrence Gap on the south coast of Barbados. A quaint spiral staircase separates both bedrooms from the large living area. A fabulous family accommodation with easy access through the apartment to the sea and pool. If the calendar indicates 'Sea Glass' is taken during your travel dates, please inquire about 'Calypso,' which is identical. Located within St. Lawrence Gap Condos, an intimate, 17-unit resort, "Sea Glass" boasts a seafront balcony with views that stretch from sunrise in the east to sunset in the west. Here, on the southern shore of Barbados, the Atlantic and Caribbean merge, creating ribbons of rich blue and turquoise water churned by Atlantic waves. It’s really something to see. Take your front row seat in a beautiful teak lounger on the balcony, and be sure to snap some photos to look back on in the cold of winter. Thanks for taking a look at 'Sea Glass' ... Let me know if you have any questions or further interest. And remember to ask about other rentals if this one is already taken. The condo was great and the location was superb!! We had everything we needed at our fingertips. I would definitely come back!! Great property - lots of space, great pool and incredible views. Internet intermittent but other than that it was superb and Ricardo was great. Nice condo. Grounds and pool are well kept. Stunning ocean views. The condo is a two-story beautiful home. The view of the ocean is stunning! We loved our stay. The building is beautiful and safe. There are so many fun things to do in the Gap. We enjoyed swimming in the ocean located in front of the property; although it does not really have a beach and would be hard for children to swim there. However, there are beaches just a few minutes away that are easy to walk to. The home is very beautiful and modern. If staying for a while and wanting to cook it would be wise to go to one of the large grocery stores a few miles away by car. There is everything available to make coffee, cook etc. There is a washing machine/dryer combination. Since this is a home and not a hotel you will need to provide your own coffee, dishwashing liquid, clothing detergent, shampoo, soap etc. I'm just letting you know so that you can get these items before arriving. Once you arrive, you are not going to want to waste your time at the store!!!!! It was such a pleasure to have you in the St Lawrence Beach Condominiums :) and to hear of your wonderful vacation. Thanks for your lovely review and we all, Ric included!, look forward to seeing you next time you visit Barbados. Beautiful location! Pool is just steps away from your bedroom door. Great arrangement for two couples. Beach and ocean are wonderful, so warm and clean, with turtles swimming with you. You can walk to the grocery store, and many nice restaurants very close. Lots of support and security right at the condo if any problems should arise. Especially appreciated all the pre information from Jane.